In 1970, Jesús Franco made Count Dracula, a vampire movie starring Christopher Lee, Klaus Kinski and Herbert Lom. It was a mostly faithful telling of Bram Stoker’s story: a naive and handsome man travels to Transylvania to conduct a real estate deal with an aged Count, becomes trapped and escapes back to England just as the Count arrives and begins sucking the blood of a young woman, who happens to be the best friend of the young man’s fiancée. Led by a scientist named Van Helsing, the young man and three other men figure out what the Count is, kill the woman who has herself been turned into a vampire and then go back to Transylvania to kill the Count. Franco was a director of notorious reputation, one who frequented the low-budget, pornier corners of European cinema for most of the 160+ films he directed. Count Dracula is the only one of his movies I’ve seen, and it isn’t terrible, but neither is it particularly good: Lee is terrific, as always, and there are some nice atmospheric moments. But the movie progressively becomes dumber as it goes along, either straying from Stoker’s original or cutting out the connective tissue that in the novel help the characters’ actions make some kind of sense. By far the best thing about the movie, though, is that Catalan experimental filmmaker Pere Portabella was there to chronicle its making. Far from a conventional behind-the-scenes documentary, however, Vampir-Cuadecuc is more like a stealth remake of the same movie, using not only the same actors, but the same takes. It’s shot entirely in black-and-white, with a creepy soundtrack composed almost entirely of drones and ambient noises (passing trains or airplanes, workers hammering away): the world as it might sound from inside a coffin. The black-and-white is grainy and high contrast, with brilliant whites and deep blacks, bringing an eerie edge to scenes that in the conventionally flat-lit, color photography of the original are bland and somnolent. The film follows the chronology of the original almost exactly, cutting out some of the more useless parts (including the entirety of Kinski’s one-note performance as the lunatic Renfield), filming the scenes as they are being filmed, but from unintended angles, such that we see the lights or cameras or behind the stage walls. Similarly we see the actors before and after their performances, getting into and out of character or simply walking around the set looking beautiful (Soledad Miranda lights up the screen in a way she just can’t as the zombified Lucy in the Franco film), often accompanied by jaunty elevator music. At the most basic level, the difference in quality between Franco and Portabella’s films can be seen in the fact that (in the version I saw, there are different cuts) Franco’s runs a seemingly endless 96 minutes, where Vampir-Cuadecuc is a very nice 69 minutes long. By removing all of the dialogue and stripping out the extraneous plotting, Portabella captures the fundamental anxiety of horror cinema, spooky sounds and images that harken all the way back to Murnau’s Nosferatu and Dreyer’s Vampyr. The only spoken words come at the end, with Lee reading from Stoker’s book itself, a far better conclusion than Franco’s limp and silly climax. It’s the stripped down, elemental adaptation of Stoker’s text counterpart to Francis Ford Coppola’s blown-up, operatic version. Taken together, there’s no reason for anyone to ever make another Dracula movie. Now that Tom Hiddleston is (thank you, Jesus!) single again, it’s as good a time as any to gaze at him, the thinking cinephile’s dreamboat, in Jim Jarmusch’s excellent 2013 vampire dramedy. Hiddleston emotes broodily as a depressed Detroit musician named Adam, opposite the always-brilliant Tilda Swinton as Eve, his beloved who lives across the globe from him yet is still profoundly connected to him. When Adam plunges into suicidal despair in the film’s early scenes, Eve rushes to his rescue. The two lovers are a gorgeous, if possibly doomed, pair who complement one another in virtually every way. Though the film leaves much unspoken about the exact nature of their relationship (how did they meet? why were they living separately? are they even the same sort of creature? ), it nevertheless makes us feel the intensity of their bond and the inevitability of their mutual entanglement in every shot. This is partly due to the deft performances of the leads, and partly due to Jarmusch’s famous attentiveness to evocative detail. Low on incident but high on atmospherics, the film creates a slyly seductive mood with exactly the right music, the right images, and the right words. Playing this Friday and Saturday at midnight only comes the latest from prolific Japanese lunatic Takashi Miike. The limited late night time slot gives a hint of what to expect, even if you’re unfamiliar with Miike’s work, much of which amounts to highly imaginative reworkings of familiar genres, pushing them to their extreme (and often extremely violent) conclusions. But while the Miike review that doesn’t contain the word “gonzo” is a rarity, he is no scattershot shock auteur, rather his films, unpredictable as they may be, are always guided by a clever intelligence. He’s not a director of chaos, but of logical absurdity. Of the more than 40 films he’s directed this century, I’ve only seen a handful, but Yakuza Apocalypse is firmly in the tradition of earlier films like Sukiyaki Western Django, 13 Assassins and his remake of the Maskai Kobayashi classic Harakiri in their critique of the psychotic masculinity that underlies the ideology of Japanese action narratives. Of course, critiquing the samurai code has been an essential part of the samurai/yakuza genres in cinema since at least the end of World War II. 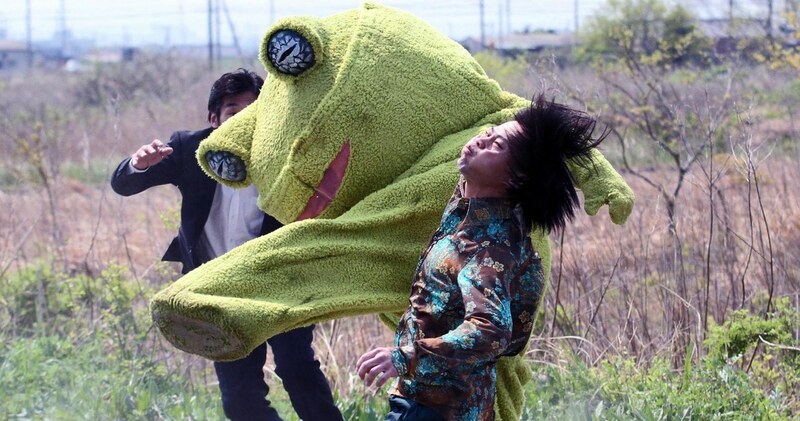 But Kobayashi, Kihachi Okamoto and Akira Kurosawa, as far as I know at least, never made a film about gangster vampires fighting demons in plushy cosplay frog outfits. 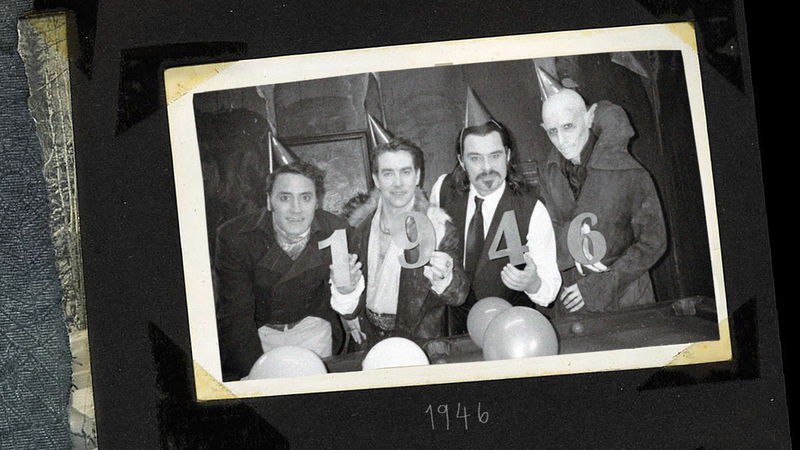 Last year, Jim Jarmusch reestablished himself in many eyes with the existential ennui of Only Lovers Left Alive. 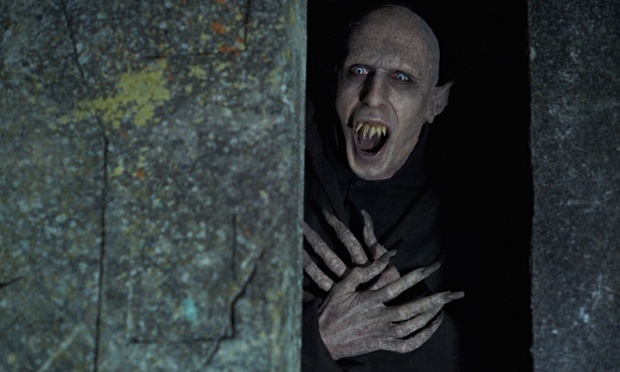 The film interrogated the realities of being a vampire, looking at the practical ramifications of living for hundreds of years. How do the centuries affect one’s outlook on life, love and art? 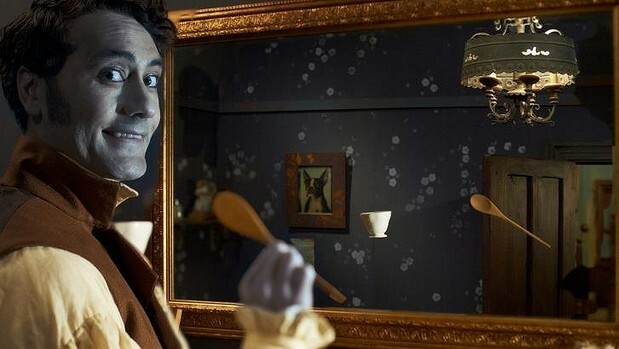 Now an unlikely companion piece arrives from New Zealand with the mockumentary, What We Do in the Shadows, from Eagle vs. Shark director Taika Waititi and frequent collaborator, Jemaine Clement of Flight of the Conchords. 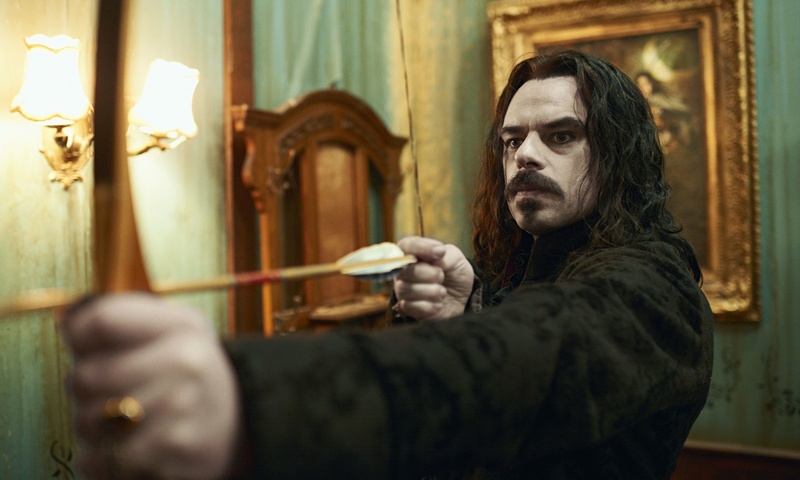 What We Do in the Shadows follows the daily humdrummery of a household of vampires, all of various vintages and dispositions. There’s the dandy, the slob, the troubled one, and Nosferatu. House meetings are called to revisit the neglected chore wheel which has resulted in a stack of blood-drenched dishes in the sink. The film is basically variations on this joke for 80-odd minutes and somewhat surprisingly, it works. It’s a slight but amiable feature, low-key but consistently fun. In keeping with the documentary facade, much of the film is shot closely with a spotlight shining directly on the leads, leaving their surroundings bathed in titular darkness. This style is particularly effective when the film introduces special effects such as flying and mutation, all of which are blended seamlessly and provide an occasional jolt amongst the chuckles. And it is mostly chuckles. But they’re consistent chuckles. The funniest scenes occur when Clement and Waititi decide to go for broke. Despite being a low budget comedy, the film doesn’t shy away from its horrific roots, occasionally doubling down on gore with fountains of deep red blood. Sure, they lay down a newspaper first but come on, that stuff gets everywhere.